Ann’s blog What’s in a Name? is mostly about human type creatures. But those of us who have had pets realize how much emotional investment is involved with coming up with the perfect name for our human companions. Everyone knows the first thing Adam did with the animals that the Lord formed out of the freshly created earth— the first sign of his dominion over them—was to give each one a name. And until Adam assigned them their names, some say, the animals did not exist. For us it all started with the name Raggedy. It was almost 50 years ago in Huntsville, Alabama just after we had moved there for my first army duty assignment. As you may have gathered from our previous blogs, naming our dogs and cats (and a random squirrel) has been an almost sacred family ritual. This ritual needs some elaboration if you really want understand what makes the creators of Big Little Meals tick. It turns out that what we name our pets may say more about us than about the pets themselves. David Macaray’s entertaining short essay What Your Pet’s Name Says About You resonated with me when he said that “the sociology of pet names is a fascinating and revealing topic” (emphasis mine). “Consider the categories of pet names. Basically, there are three: Clever, Descriptive and Derivative. And remember: The category in which your pet name falls speaks volumes about the person who assigned the name”. Curious to see how our pets’ names stacked up to Macaray’s categories, I constructed the below table. A sure sign that you’re a pretentious, attention-grabbing poser is when you need to explain the animal’s name. A cat’s name should never have to be explained. Ouch! Our cat and dog name repertoire has resulted in a great deal of explanation over the years. To be fair, “Raggedy” was a clever name, but it was so obvious. How could anyone not get “Raggedy, Ann, and Andy?” No explanation needed! But over time our naming got worse, or to put it another way, more clever. Raggedy in Fort Collins, Co.
Ann got our first dog while I was stationed in Vietnam. Just how we decided to have a dog then is a story in itself for another time, but we ended up naming our new Aussie puppy Marcus (in honor of March, the month I left for Vietnam and a year later the month I returned). Not that clever, but we thought it very apropos. Marcus quickly learned that human beds were also dog beds, at least at our place! When I returned from Vietnam, I joined Ann (and Raggedy and Marcus) in Fort Collins to attend graduate school. It wasn’t long before I came across an abandoned cat (which I thought was a kitten) at the local dump. Of course I brought her home. We named her Kitten Kaboodle (as in “the whole kit and caboodle“). It turned out that Kaboodle was expecting – spaying and neutering were not part of the public discourse in those days – so we ended up keeping two of her kittens which we dubbed Cracklin and Rosie. Not coincidentally, Neil Diamond’s hit song Cracklin Rosie had just been released. We were approaching the “pretentious, attention-grabbing poser” status. 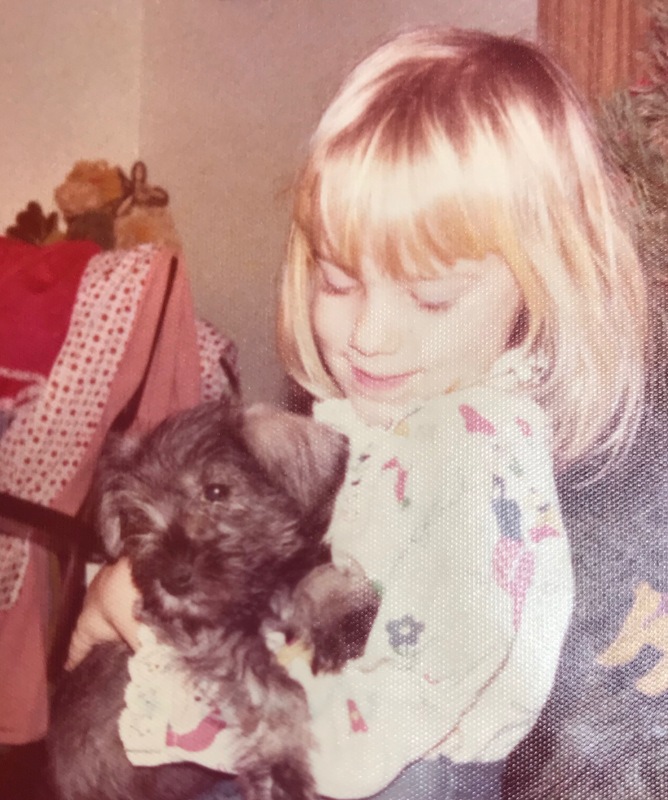 After grad school in 1975, we moved to Baton Rouge and had to get a new kitty “for the sake of the children,” so Ann argued. We ended up with a Siamese kitten that of course needed a name (fortunately this cat wasn’t expecting). Sara, who was four at the time, asked how old the kitten was and we told her it wasn’t even one year old yet. “Then he must be Zero,” she said. Hence a new name was born. Clever? Descriptive? Minus, like Marcus, quickly recognized that human beds were not strictly for humans, continuing a disturbing pattern of behavior that has persisted amongst our pets. I should add that our next Siamese cat’s name, Minus, reflected our conviction that no other cat could surpass Zero. And isn’t minus less than zero? Clever? You be the judge. Rio Chama, our third Aussie, got her name because we had just been in New Mexico and loved the area along the Rio Chama River. Not in the clever column, but we liked the name’s feel. We resumed our pathological pattern of pet naming when we moved to Glen Ellen. Our three current human companions are testimony to this. For those who have not seen the blockbuster video in a previous Andy’s Corner, we now have Oakley Devine, our fourth Aussie and she is from Colorado. What would be more appropriate than to name her in honor of Annie Oakley, the sharp-shooting cowgirl star? And since there was no famous Andy Oakleys, we selected Devine in honor of Andy Devine of cowboy television fame. This is both “clever” and “derivative,” but a real stretch to explain. Mr. Macaray would be appalled. Our current furry crew of misnomers, all on our bed of course. Finally, we have Ono Moore and Choco Latte, who starred in the wildly popular A Tale of Two Kitties: The Best and Worst of Times. We chose Ono Moore‘s name because at the time we thought she would be our last cat (think “oh no more cats”). But not so – along came Choco Latte, making Ono Moore’s name moot. “Choco” is a somewhat clever but mainly descriptive name, as you can see by the coloring of his coat. You would think that after all of these years of imposing clever names on our pets we would have learned that we continue to project ourselves as “attention-grabbing posers.” But it is far from over. We already have a name picked out for our next cat – Fortuna. For more about that you can go to my recent blog, WHAT IF Fortuna is More Than Just a Clever Name for a Cat? . In the end, our choice to continue to use clever pet names says a lot about who we are and quite frankly, we think that we are pretty funny. Furthermore, we refuse to be intimidated by the specter of social condemnation by clever-name nay sayers. Hmm. Wonder what kind of cat we’ll find that will fit the name “Fortuna?” Check back later to see. Post Script: I have to include a photo taken in Carmel that our friend Jane sent us after reading our blog. Do you remember our cat named C.C.? That was short for corner crapper. Not near as clever as your cat’s names. You alway were the smart one in the family. Of course I remember CC. Thanks for bringing that up. It hadn’t occurred to me that my attraction to clever pet names might be genetic. However, if I recall, we did have a collie named Lassie. That’s bad news according to Macaray who says, “Calling your dog “Lassie,” or “Marmaduke” is the sign of a needy, feeble-minded person”. I can understand the feeble-minded part, but the “needy”?? Our friend Carolyn has this to say: Pet names in our family (all cats): Mountolive and Mehitabel (guess what I was reading). Feiffer (for the cartoonist). Abner . . . because we liked it? Tigger (the most obvious, silly name, but by far the best pet ever!). Angelina Popolina Fineberg (named by four-year-old Jenny). Miss Kitty (feral cat not around long enough to “earn” a real name). Clara (after Clara Bow, the “it” girl). And Paws (current companion). He was “Claws” when we adopted him. We thought it a kindness to soften it to Paws. Next in line? Who knows. I replied to her thusly: Thanks for sharing your cat names, but I don’t know. It looks like you have a number of clever names in the mix. Not that I would ever suggest that you may be an “attention-grabbing poser.” Also, do you know why the cat who was crossing the desert thought that he was at the North Pole? Because he looked down and saw Sandy Claws. So sorry about that. I have been waiting for many years for an excuse to tell that one.